My experience with the Dead Space franchise is something of the proverbial mixed bag of assorted human intestines. I love the visual aesthetic, the stories and characterisation, the level of attention to detail that went into making the setting, and especially how it pays homage to movies like Alien, Event Horizon, 2001: A Space Odyssey and The Thing. On the the other hand I found it’s over-reliance on jump scares tiresome, to the point where many enemy encounters felt like glorified games of “whack-a-mole” with air vents. That and I simply don’t find the Necromorphs scary. I can understand how and why they’re supposed to be scary – I’m no stranger to the idea of “body horror” – but only in a detached academic sort of way, much like how I understand and appreciate why clowns terrify some people without being a coulrophobe myself. None of this means I didn’t enjoy stomping on mutated human corpses for loot like fleshy pinatas however, so I’m still looking forward to playing Dead Space 3 when it comes out. At least I did until the news today that Dead Space 3 will be the latest EA-produced title to feature in-game microtransactions. In Dead Space 3 Isaac Clarke and his new gung-ho military chum, John Carver, can scavenge junk, scrap and other tat just lying around and glue them to their guns to make them better, faster, stronger and more kill-y. As weapon modification goes its straight out of the Warhammer 40,000 Ork school of “More Dakka“, which is no bad thing. Problem is there are only so many discarded nails and bits of old tin available for salvage in one playthrough however, presumably less if you’re playing co-op with a friend, and this is where the option to buy scrap with real money comes in. According to Eurogamer if you lack the requisite bits of old fridge to turn your rinky-dink plasma cutter into a Super Awesome Plasma Cutter of Mess-Up-Yo-Shizzle, Dead Space 3 cheerfully provides an option – slyly labelled “downloadable content” in the in-game store screen – to buy some more for real-world dosh. 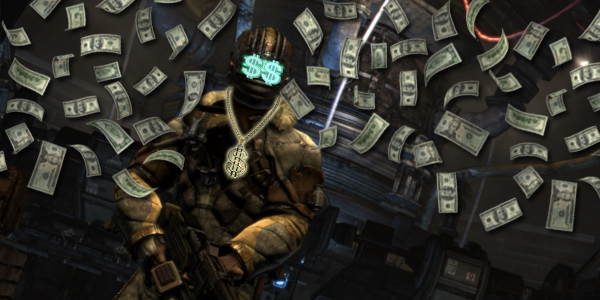 So if you really, really want some sparkly bling for whatever Dead Space 3’s equivalent of the Ripper will be yet don’t have enough Arbitrary Resource Points, you can splash some cash and walk away with it there and then. Ideally on your way to trade it for something else because the Ripper has always been a terrible weapon. Associate Producer Yara Khoury insists Dead Space 3 will never require players to exchange cash-for-pixels and Visceral won’t let you buy the best weapons until you’ve tromped around on the planet for a fair old while first, although it’s hard not to feel a mite cynical about this. If it’s not absolutely essential then what reason is there to put the option in the game? Other than to milk money from Dead Space players at the behest of Electronic Arts. It’s not like paying real cash for upgrades gives you any sort of competitive edge given Dead Space 3 is reportedly ditching competitive multiplayer for its new co-op mode. So who is this option really meant to cater to? Dedicated fans who wanted every gun and armour upgrade have always had a New Game Plus mode to acquire them with, and I presume they also replay it because they really bloody love playing Dead Space. Encouraging them to pay money in order to not-play as much of a game they clearly love playing, else they wouldn’t play it again in the first place, seems counterproductive. Meanwhile the casual Dead Space appreciator will likely buy the game, play it once and be perfectly satisfied. What’s their incentive? I know not everyone has time for super-long epic games nowadays but this isn’t a grindy JRPG or a stonking great MMO we’re talking about. It’s bloody Dead Space! If you went to see a movie and I offered to let you pay more money, on top of the price you’ve already paid for admission, to not-watch as much of the movie you wanted to see badly enough to buy a ticket for in the first place, you’d be quite justified in telling me to piss off. It’s an insane idea and one even a crazy person would think twice about. Actually come to think of it…people in the Dead Space universe are often plagued by strange compulsions, bizarre hallucinations and lunatic ideas caused by ancient monoliths of alien origin called The Markers. Has anyone checked if EA has one of these Markers tucked away somewhere in their Redwood HQ?